Click here for the 2016 HockomockSports Girls Lacrosse Awards. WELLESLEY, Mass. – The Franklin defense was able to keep the Panthers in Monday evening’s Div. 1 state semifinal at Babson College’s MacDowell Field, holding North Andover to just eight goals (two of them empty net goals in the final minutes), but the offense faltered against the Scarlet Knights’ zone look. The Panthers were limited to just two goals in each half, their lowest scoring output of the season, and saw their season come to a close with an 8-4 loss. In the first half, senior Dani Lonati was a match for Hiller, a University of Massachusetts commit, with eight of her 10 saves. After Julia Jette opened the scoring 29 seconds into the game off an assist by Kendall Reardon, Lonati stopped four shots, including two free positions, on the first North Andover possession. She continued to dominate the Knights as the half wore on and Diana Griffin doubled Franklin’s lead with 15:02 before the break on an assist by Caroline Lounsbury. Unfortunately for Franklin that would be the last goal that it would score for the next 27 minutes of game time. North Andover scored twice before halftime to tie the game and then added two more in the opening eight minutes of the second half. Freshman Annie Walsh got one back for the Panthers when she bounced in a free position goal that cut the deficit to just one. Again, the Knights had the answer, scoring the next two goals before Emily Spath ended the run with a free position with 4:40 remaining. By that time, Igoe had already called Lonati off the field to get an extra defender on and the Knights would take advantage of the empty net to tack on two more goals. “I’ve been in that place, exactly where Franklin was, the past two years where you’re going as hard as you can and it’s not a fun place to be and I’m glad we’re on the other side of it this season,” said Prior. While disappointed in the loss, Igoe refused to let that be the final word on the Panthers and the season that they have had, which included the program’s second sectional title and another undefeated Hockomock League championship. “I told them don’t let one game define you,” said Igoe. “At the beginning of the season, I wasn’t sure how it would go. In the first Needham game, someone asked how we were going to do and I said, I don’t know; we could get killed and then we tied them and from there this team won a sectional championship. Below are the official Hockomock League Girls Lacrosse All Stars. FRANKLIN, Mass. – Prior to taking on Acton-Boxboro, Franklin gathered together to watch footage of the program’s only sectional title win. The players were inspired by the film of the dramatic victory over Concord-Carlisle, but those positive memories did not translate into a great start to Thursday’s Div. 1 East final at Pisini Field. The Panthers struggled to find the cage in the first half against the Colonials and went into halftime trailing 5-2. Franklin did not panic. The players huddled together, reminded of the tough games that they have played this season, and made a couple of small changes. The Panthers turned the game on its head with five straight goals after halftime and then held on to possession for the final four minutes of the game to pull out a 7-6 victory to claim the program’s second sectional title. “It feels amazing, my senior year, our home turf…there’s no better feeling,” said senior midfielder Kenzie Pleshaw. The recently-named Hockomock League MVP scored three goals to lead the Panthers. Pleshaw opened the scoring after six minutes of possession by the Panthers. A-B answered right back off the ensuing draw and then, five minutes of Franklin possession later, forced a turnover and scored in transition to take the lead. After A-B scored its third, freshman Annie Walsh scooped a ground ball in the defensive zone and started a quick break that flowed through Julia Jette up to Emily Spath, who finished to make it 3-2. The momentum did not stick with the home team, as A-B closed the half with a pair of goals, while Franklin went 10 minutes without finding the back of the net. The Panthers answered the call and it was Pleshaw that gave them the spark with a goal five minutes after the break. It was a patient possession and she took multiple opportunities to probe the A-B defense before dodging past her marker and finishing on the run. Two minutes later, Franklin burst forward in transition and Kendall Reardon caught the A-B goalie out of position to feed Spath all alone in front of the cage to make it 5-4. Walsh won the ensuing draw control and then bounced in the game-tying goal from a free position. A-B smacked the bar with a shot in transition, but that was a rare chance for the Colonials in the second half. Dani Lonati made four saves for the Panthers and the defense, led as always by Olivia Truenow, Sam Jones, and Dana Lewandowski, stymied A-B time and time again. “We changed up the game plan a little bit; [Julia Neyland] was doing great for them and we marked her up a little tighter and…when the other team went to goal we just crashed, no swinging,” said Igoe. Julia Jette gave the Panthers their first lead since it was 1-0 when she finished off a pass by Caroline Lounsbury from a free position. Pleshaw raced down straight off the draw and drove to the net to give Franklin a two-goal lead with her third of the game. Caroline Maxwell scored off an eight-meter opportunity to cut the lead back to one with 9:02 remaining, but it would be the last goal of the game. With 3:59 remaining, the Panthers grabbed possession in front of their bench and Igoe immediately called timeout. Franklin set up a plan for the final minutes that included attempting to score another goal but A-B goalie Brenna Keefe made two big saves. Pleshaw admitted there were “flashbacks” to last year and the semifinal against Lincoln-Sudbury where the Panthers turned the ball over in the final minute and the Warriors scored to tie the game and then eventually won in OT. This time, Franklin held on, swinging the ball from side to side, and pulled out the victory to set off a celebration made even sweeter by the fact it was taking place on home turf. “We just ran our hearts out and even though we were tired it didn’t matter,” said Pleshaw. “If you had the ball, you were going to run like you were in a marathon. 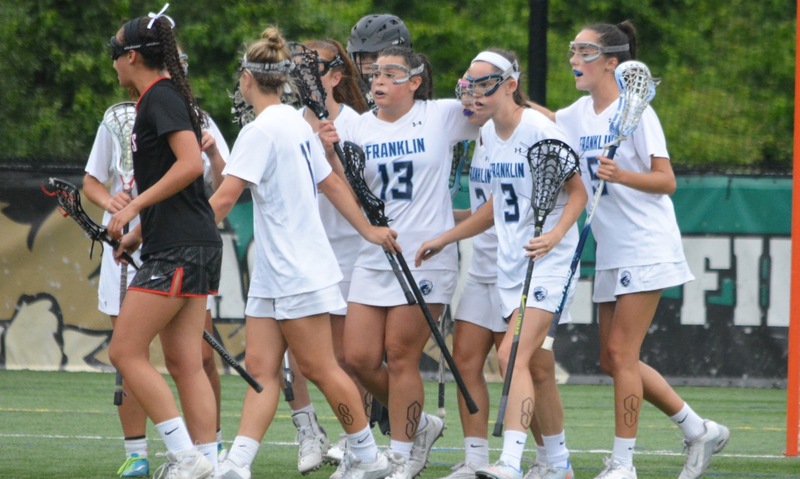 Franklin (19-4) will face North champion North Andover in the state semifinal at Babson College on Monday. The teams squared off in April with the Scarlet Knights pulling out a 9-8 win. FRANKLIN, Mass. – For the second time in three seasons, Franklin will be playing in the Div. 1 East final, following a 14-7 victory on Tuesday night against fifth seed Bishop Feehan at Pisini Field. The Panthers beat Feehan for the second time this season (Franklin won 10-3 in the regular season meeting) and the experience of playing a regular season schedule loaded with tournament-caliber opponents, including many ranked in the top 10 in the state, is paying off, according to head coach Kristin Igoe. The Panthers have faced the likes of Westwood, Notre Dame Academy (Hingham), and Needham, which are widely considered the top three programs in the state, as well as perennial Div. 1 powers like North Andover, Lincoln-Sudbury, and Andover. With that experience under their belts, Franklin was ready to play a type of defense that Feehan coach Nancy Anderson-Semple admitted was on a different level of physicality than the Shamrocks had encountered in the regular season. “They’re playing teams that are tougher than ours during the season, so they’re used to playing that way,” said Anderson-Semple. “A lot of our kids have bruises everywhere, hits to the head, all that kind of stuff; we’re not used to that physical type of play. While the Panthers had success against the Shamrocks in the regular season, Igoe insisted her team was focused to take on Feehan on Tuesday. She said, “Our biggest thing was don’t underestimate Bishop Feehan. Even though we beat them in the regular season, it doesn’t matter. It’s tournament; it’s a whole new slate. Thanks to strong play on the draws from senior Mandy Semple, Feehan was able to hang with the Panthers early in the game. Freshman Annie Walsh opened the scoring on a drive to her right hand three minutes in but the Shamrocks quickly answered to tie it. Kendall Reardon scored on a low, eight-meter shot to regain the lead and Kenzie Pleshaw, who was recently named the Hockomock League MVP, made it 3-1 with a sidearm shot on the run, undeterred by a bump on her way to goal. Semple got one back but Emily Spath came down 24 seconds later to make it 4-2. The defensive unit for Franklin proved to be the difference in the first half with a strong ride that stymied the Shamrocks in transition and then a settled defense that took away cuts and passing lanes. Led by Sam Jones, Olivia Truenow, Grace McDermott, and Dana Lewandowski, among others, the Panthers would limit Feehan to just three goals in the opening half. Meanwhile, the offense was clicking into gear. Caroline Lounsbury assisted on Spath’s goal and on the next goal by Julia Jette that capped off a transition started by Truenow’s outlet pass. After Semple scored her second, Lounsbury converted an eight-meter try for her first goal of the game. Pleshaw capped the half with a pinpoint shot across her body into the top corner with three seconds on the clock to give Franklin an 8-3 lead at the break. Feehan tried to turn things around in the second half and again the draw controls played their part as the Shamrocks won the first two and turned both into goals by Caroline Toomey. But, Walsh snagged the next draw control for the Panthers and then converted on a free position for her second of the night. Semple converted her hat trick but Feehan still could not put a run together, as the score stayed 9-6 or five minutes before Diana Griffin put one under the bar for the Panthers, which was followed by goals from Pleshaw and Reardon to build the lead to six. Feehan scored to make it 12-7 with 5:20 remaining but before the ensuing draw, lightning was seen and the teams had to take a 45-minute break until the weather cleared. Walsh scored off an assist by Pleshaw and then played provider on Griffin’s second to let the Panthers close out the game in style. It was not unexpected to see the Panthers, the top seed in the sectional, get back into the final, but a little bit of a surprise is that it will be Acton-Boxboro making the trip to Franklin on Thursday night, not No. 2 seed Lincoln-Sudbury. The final is scheduled for Thursday at 6 p.m.
FRANKLIN, Mass. – It just snowballed for the home team. An early yellow card, a quick goal, the pressure ratcheted up and next thing that Franklin knew it was trailing Notre Dame Academy (Hingham), the top ranked team in the state, 7-0 midway through the first half. It proved to be a deficit too deep to recover from and NDA rolled to a 15-4 victory on Monday night at Pisini Field and showed that the Panthers still have some work to do to compete with the very best in the state. Franklin defender Sam Jones picked up a yellow card for a foul just 1:12 into the game. The controversial call put NDA up a player and the Cougars took advantage. Freshman Madison Ahern scored the first of her four goals to put the visitors in front. Senior Morgan Caron followed with the first two of her four goals on the night and Igoe was forced to call a timeout with the Panthers down 3-0 after seven minutes. 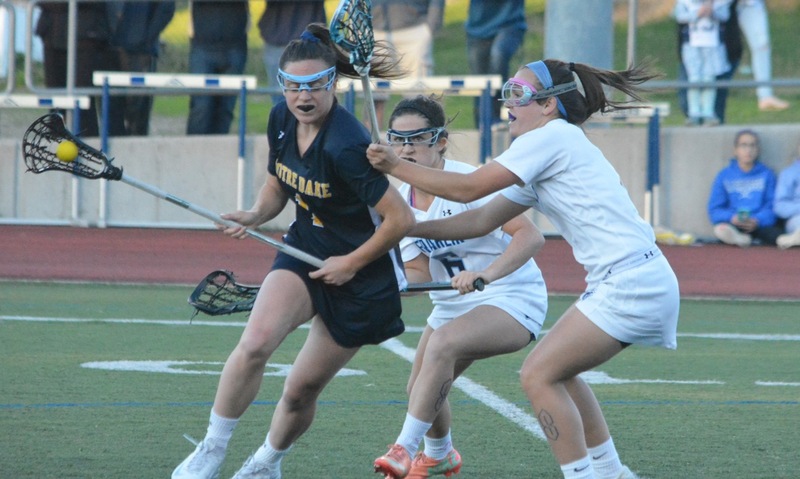 NDA star Charlotte Allard tacked on a pair of goals and then another freshman, Kelsey Kenney, scored a pair before Franklin could get on the board. Caroline Lounsbury finally found the back of the net for the Panthers off an Emily Spath assist and then Spath made it 7-2 with a sidearm finish. The momentum was short-lived, as Ahern came right back with a pair of goals, slicing through the heart of the Franklin defense. Franklin’s transition game, generally a strong suit for the Panthers, was being swallowed up by NDA’s aggressive defense and its ability to send multiple players to the ball on the ride. With 5:40 left in the half, the Panthers finally broke free thanks to a good run by Grace MacCallum, who split a few defenders before passing to Kendall Reardon who hit Julia Jette for the goal. When Dani Lonati made her seventh save of the first half to stuff an Allard chance, Franklin had another break that could have cut the lead to just five with a few minutes to go before the break, but Jette saw her shot saved by freshman Caroline Cooper. Lonati would make eight saves on the night and Igoe praised her senior goalie for another big game against a strong opponent. Unfortunately, Igoe noted that Lonati’s saves could only do so much when the Panthers could not get the ball into the attack. “Dani played awesome,” Igoe said. “She kept us in the game, but then we couldn’t clear; we couldn’t get the ball up. So, then they just get it right back and we have to play defense for another five minutes. In the second half, Franklin appeared to have forced a turnover, but a late foul was called against Kenzie Pleshaw that gave NDA back possession. On the whistle, Allard fired a pass across the face of goal to a wide open Kenney for her third goal of the game. That sparked another big NDA run of five straight goals that ended any thought of a potential comeback by Franklin. When asked about the importance of not settling for the lead, NDA coach Meredith Frank responded, “Franklin’s a fantastic team. They have a lot of fast, athletic players, so we couldn’t ever rest or ever think they weren’t going to come back hungry and make plays. Spath scored her second goal of the game with 5:41 remaining, skipping her shot off Cooper’s stick and under the bar, but Caron scored her fourth with three minutes left to wrap up the scoring and a dominant performance by the Cougars. 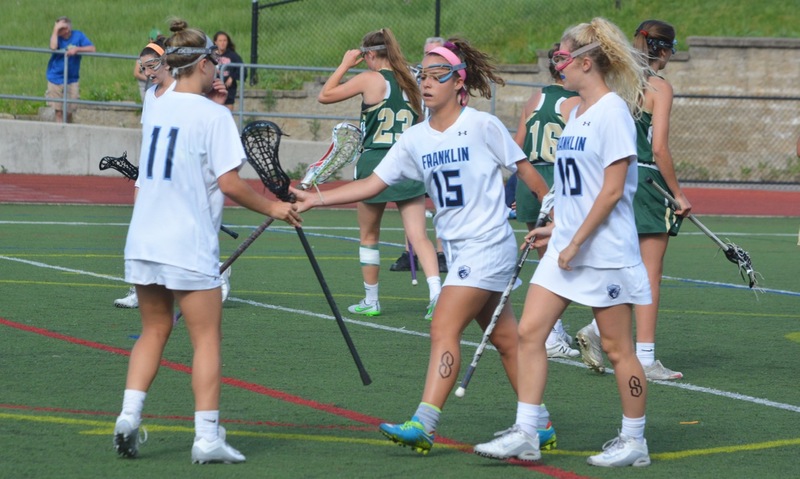 Franklin (12-3) will try to rebound when it travels to Foxboro for a battle of league leaders on Wednesday. NDA will get another Hockomock League opponent on Friday when North Attleboro pays a visit to Hingham. Foxboro, 2 @ North Attleboro, 3 – Final (9 inn.) – Kaylea Sherman knocked in Mycala Moody with a two out RBI in the bottom of the ninth inning for the win. Moody finished with three hits and Sherman and Jordan Sharpe each had a pair of hits. Amelia Murphy got the win, tossing a complete game with just one earned run allowed, striking out five. Franklin, 10 @ Lincoln-Sudbury, 9 – Final – The teams combined for 19 goals but Franklin head coach Kristin Igoe said goalie Dani Lonati was the difference, making 11 saves in net. Freshman Annie Walsh won a crucial late draw and the Panthers were able to run out the rest of clock. Kendall Reardon scored an empty net goal with a minute left to put Franklin up 10-8 before L-S cut it to one off the next draw. Kenzie Pleshaw led Franklin with four goals and Emily Spath netted three goals. Taunton, 7 @ Norton, 11 – Final – Hannah Moniz was the top scorer for Taunton with two goals and an assist. Kayla Philips added a pair of goals and Abbey Kingman had a goal and an assist. Layne Kingman and Bre Conlon also had goals for the Tigers and Lorna Li made 15 saves. FRANKLIN, Mass. 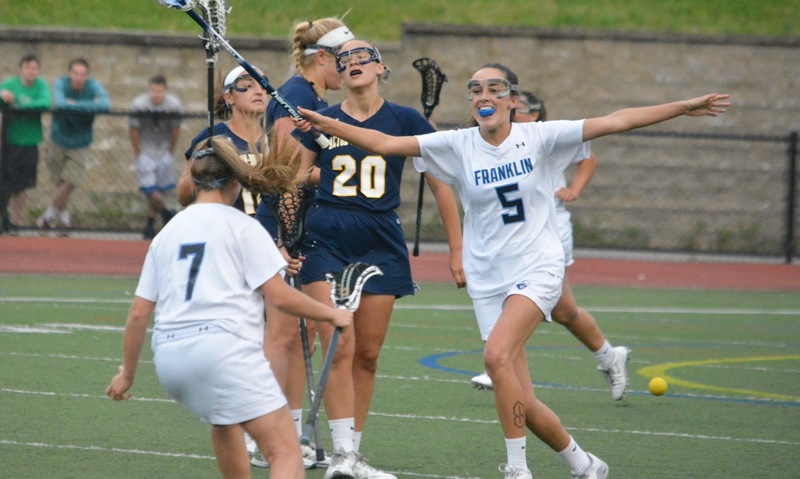 – On Thursday evening, the Franklin girls’ lacrosse team began a run of five straight games against teams ranked among the top 25 in the state with the visit of Div. 1 Central/East rival Concord-Carlisle, which won the sectional title last spring. After losing a second half lead against Needham in the season opener and eventually falling in overtime, this was an opportunity for the Panthers to pick up a marquee win early in the season and build momentum for a difficult portion of the schedule. It did not start well. The Patriots jumped out to a 4-1 lead in the first half, but senior midfielder Kenzie Pleshaw took over with four goals before the break and five in the game to spark a Franklin comeback that turned into a comfortable 13-7 victory. The Patriots, behind star senior Hannah Dudley, dominated the draw controls at the start of the game. 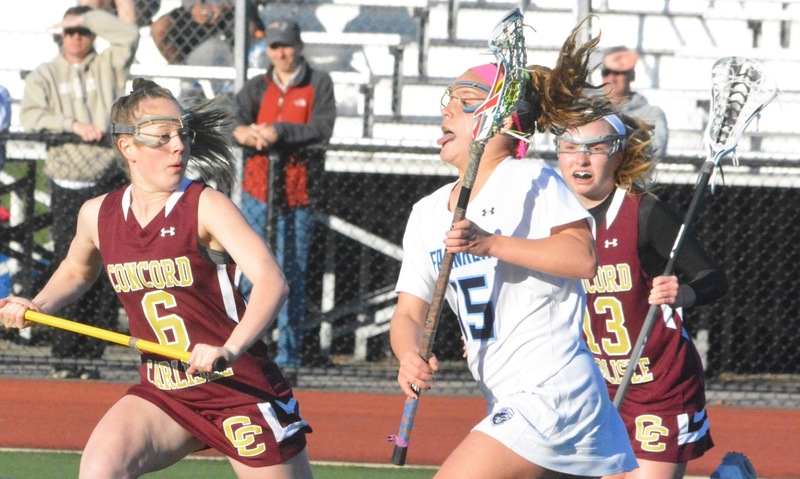 Concord-Carlisle won the first six draws as they built an early lead and goalie Abby Flynn made three of her six first half saves to keep Franklin off the board. The game changed when the Panthers switched things up in the middle. Sophomore Grace MacCallum was moved in and took the draws against Dudley. From that point on Franklin won five of the last seven draws in the first half and nine of the next 13 overall. Julia Jette, who reached the 100-goal plateau on Wednesday, scored to cut the Patriots lead to 4-2 and then 23 seconds later, after the Panthers won the draw control, Pleshaw notched her first goal and just like that Franklin was down by one. Junior Kendall Reardon tied the game, but the Patriots answered back with 8:19 to play in the first half. Three minutes later, Pleshaw shook off her defender with a spin move and finished over the top of Flynn to tie it again. Two minutes later, she completed her hat trick with a shot on the run. With 1:39 left in the half, she made it 7-5 with a shot cutting across the middle. The momentum did not waver after the break. Emily Spath stole a clearance and fed Jette for a goal four minutes after the break and then four minutes later Pleshaw earned a free position and finished it. When the Panthers added another on a quick transition between Reardon, Spath, and finished off by Diana Griffin, the visitors were forced to take a timeout. In the huddle Igoe reminded the Panthers of the lead that they held against Needham in the season opener and how important it was to keep pushing to extend the advantage. A couple minutes after the timeout, Reardon got her second goal of the game, capping a 7-0 run that gave the Panthers a six-goal lead. After the patriots ended the run, Spath added her second goal on a free position. Griffin would also get her second of the game to answer another Patriots goal with 2:25 to play. The offense was clicking but it was the defense that turned the tables on the Patriots. Senior Sam Jones controlled the defense, as the Panthers closed off the middle of the field, and classmate Dani Lonati came through with eight saves, including a couple down the stretch that kept the Patriots from changing momentum. It was the perfect way to start this tough stretch for the Panthers (4-1), but Igoe wanted to make sure that her team was not getting carried away with a trip to North Andover looming on Saturday.